Italy’s largest lake, surrounded by three distinct regions – Lombardy, Trentino Alto-Adige and the Veneto attracts people from all around the globe with it’s cultural and natural diversities. Steep alpine foothills border the northern edge of the lake while the southern shore is lined by beaches and backed by low hills. It’s location gives Lake Garda a year-round mild climate where olives and lemons beautify the surroundings, while it’s towns with lakeside promenades make post-card scenery. Start your visit in the charming town of Desenzano del Garda and it’s Villa Romana capturing the impressive Roman mosaics. Discover the roots of rich history in the little town of Sirmione and it’s famous Scaligeri Fortress, water-surrounded construction from 12th century built by the Scaligeri, Verona’s ruling family. Climb the tower for breathtaking views of the lake and town and admire the interior of the fort. In the past, Romans used this location for bathing in hot water springs, which are now part of a luxury spa. Explore the wonderful towns of the southeast shore of the lake, rising on the slopes of Monte Baldo. 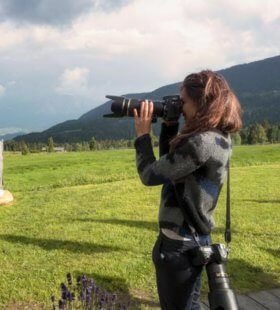 Take your personal professional photographer in Lake Garda with you and let him capture the landscape of olives and vine fields mixed with the lively touch of tiny harbours and promenades.